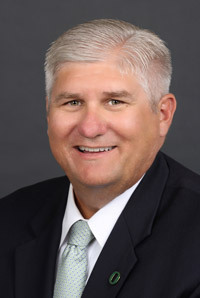 Dr. Roger J. Thompson is the Vice President for Student Services and Enrollment Management for the University of Oregon. He is responsible for services that contribute to enhancing the student experience, recruitment, retention, and graduation. His portfolio also includes providing online and continuing education for the community. During his tenure, enrollment at the University of Oregon has reached record levels for total enrollment, academic quality, diversity, including ethnicity, socio-economic, and international representation, and freshmen-to-sophomore retention rates. Roger has been a frequent presenter at national and regional conferences throughout the country and has published in the areas of college choice, student persistence, student success, and affordability issues in higher education. Additionally, Roger serves on the statewide Board of Directors for Special Olympics Oregon. A native Oregonian, Roger served in similar positions at Indiana University and the University of Alabama prior to joining the UO. He earned his doctorate in Higher Education Policy and Administration from the University of Southern California.